On an otherwise ordinary day, Elliot discovers something extraordinary: the power of mindfulness. When he asks his neighbor Carmen for a snack, he's at first disappointed when she hands him an apple - he wanted candy! 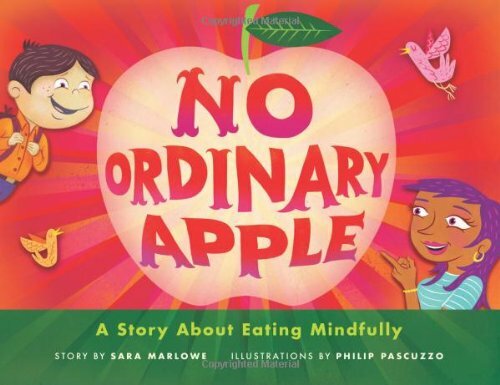 But when encouraged to carefully and attentively look, feel, smell, taste, and even listen to the apple, Elliot discovers that this apple is not ordinary at all.<br /> <br />Lushly and humorously illustrated, <i>No Ordinary Apple</i> makes a traditional technique for training mindfulness a fun and enjoyable way for children to learn to slow down and appreciate even the simplest things. Sara Marlowe is a musician, clinical social worker, and university lecturer. She has been meditating for many years and takes delight in sharing mindfulness with children, youth, and families. She lives in Toronto with her husband, son, and two cats. She can be found online at saramarlowe.wordpress.com and www.mindfulfamilies.ca.<br /> <br />Phil Pascuzzo is an artist and designer living in Albany, New York. He's designed countless book covers, and provided illustrations for <i>No Ordinary Apple</i>.